Like the calm breeze of a summer walk through the field! A little bit lemon, a little bit sun, & the calming effect of cleansing sage! Ingredients: Water. Saponified oils of palm, palm kernel, olive, sunflower, castor, sweet almond. 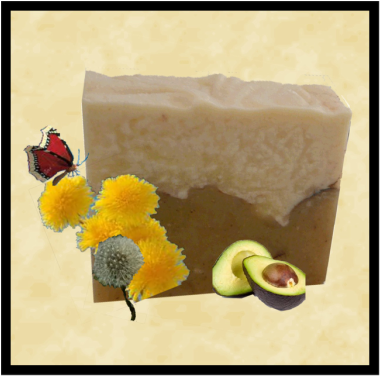 Avocado butter, essential oil, confectioners sugar, lemon juice, dandelions. The Angel of Flowers came to earth to find the Flower she would most love. She visited & asked each flower where they would most like to live, and why. Each one gave her an arrogant, prideful answer, and so she passed them by. Then she came to the Dandelion and asked her question. "I want to live where happy children may find me when they run by, to school, or to play. I want to live by the roadside, and in the meadows, and push up between stones in the city yards so that everyone will be glad because of my bright cheery color. "Oh Dandelion" the Angel of Flowers exclaimed, "You are the one I love the most! You shall bloom everywhere and shall be the children's flower!" Legend says that before going into battle, Malay warriors would protect themselves by rubbing lemongrass all over their body. They believed this magical invisible armor would make them impregnable to weapons. We do not know the effectiveness of it against daggers but since time immemorial, lemongrass had been used to protect against coughs and colds.